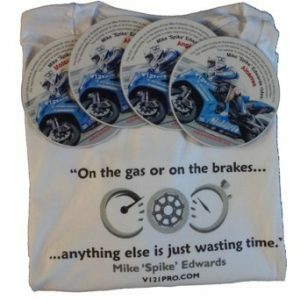 ‘On the gas or on the brakes… t shirt £9.99 incl. p&p. I seem to hear myself saying this phrase to coaching clients over and over again – so much so, that it’s almost become iconic – on a plain white t-shirt. 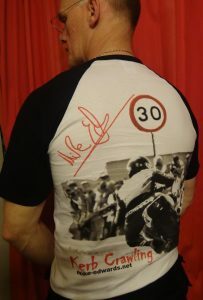 ‘Kerb Crawling’ NorthWest 200… t shirt £12.99 incl. p&p. I enjoyed riding on the pure roads at the North West 200 – this t-shirt is designed from a great original photo by Dave Burr. Taken in 1992 when I was riding a Magic Wheels Honda CBR600 – I finished 3rd that year, but won the race when I went back in 1994. – on a white baseball style t-shirt with black sleeves. Which 4 tracks on DVD? 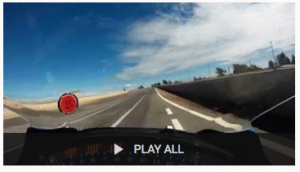 Which 4 tracks to download?